The PM-920 was Prime Manufacturing's copy of the Leslie S-3L. Externally, the horns can be distinguished by perfectly round contour where the bells meet the base on the Prime horns, compared to a more complex contour on the Leslie horns, and by the absence of the Leslie trademark on the manifold. The horn pictured uses the triangular base that would have been an L-manifold on a Leslie horn; a base similar to the standard Leslie diamond-shaped manifold was also an option. Prime no longer manufactures locomotive airhorns, but PM-920's can still be heard on BNSF and Union Pacific, intermixed with their S-3L's. 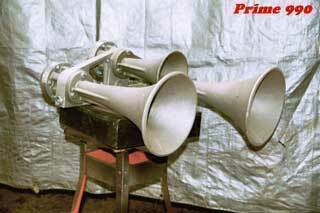 The sound is essentially indistinguishable from an S-3L. The PM-990 was Prime Manufacturing's copy of the Leslie S-3K. 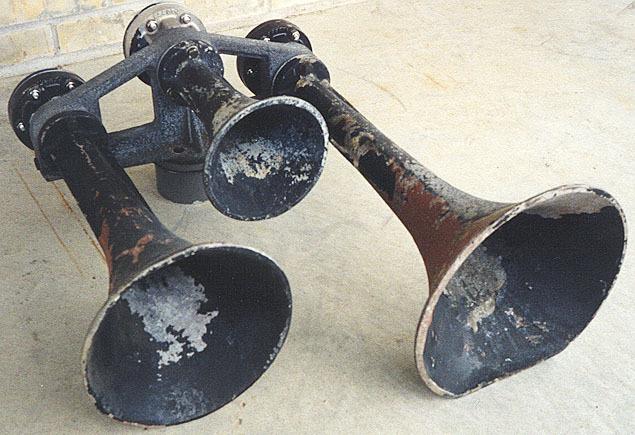 Externally, there are a few subtle differences between the Prime and Leslie horns, particularly in the shape of the bell and power chamber where they meet the base. The Prime castings are also somewhat heavier than Leslie castings, and the absence of the Leslie trademark on the manifold is a dead giveaway. Prime no longer manufactures locomotive airhorns, but examples of the PM-990 can still be heard on some former Burlington Northern locomotives. The sound is essentially indistinguishable from an S-3K.